For kitchens that fall on the compact side, a galley plan makes efficient use of space. Galley kitchens, with two counters running along two parallel walls forming a central path down the middle, optimise space by creating abundant storage and worktop space. Small galley kitchens are a fitting solution and allow the shortest access to all areas of the kitchen – extremely practical for the user. If your kitchen runs the risk of looking too cramped you can help to counteract the enclosed feeling through your choice of finish and furniture. To enhance a feeling of space and lightness, pale colours and high-gloss finishes can aid with opening up the kitchen and reflecting light. By raising your appliances and cabinets off the floor, you will be able to create the illusion of a space that has more height. If possible, hide appliances behind your cabinets as having lots on display could lead to a visual clutter. There are advantages to this type of storage in a galley kitchen in that it reduces the heavy look of cabinetry covering every space and secondly, with carefully selected pieces on display, you can create a nice focal point for the room. More important than in this type of kitchen than most, you need to give extra thought to the storage planning stage of a galley kitchen. Using the inside and outside of cabinet doors and creating a tall pantry space keeps everything to hand and helps you stay organised. Keep the cooker and the sink located on the same wall, preferably with the sink at the end of the counter so it doesn’t get in the way when you’re preparing food. Dedicate one wall to cooking so that will be the place for the stove and appliances which means that two people can work freely at the same time. For more tips on functional design, take a look at our article on the golden triangle. For some, a portable island cart could be just the solution to your lack of storage woes. Especially when you know you can just wheel it in and out of the kitchen when you need, and keep it somewhere out of the way when you don’t. If you need to extend your storage in a small galley kitchen, build into spaces you can’t reach. It sounds counter-intuitive but it’s definitely a sensible option when you don’t have the space to extend in other directions, and all it takes is a step stool that you can tidy away easily for access. We hope you’ve found some inspiring ideas for when the time comes to design your own galley kitchen. Fancy a design appointment with one of our surveyors? 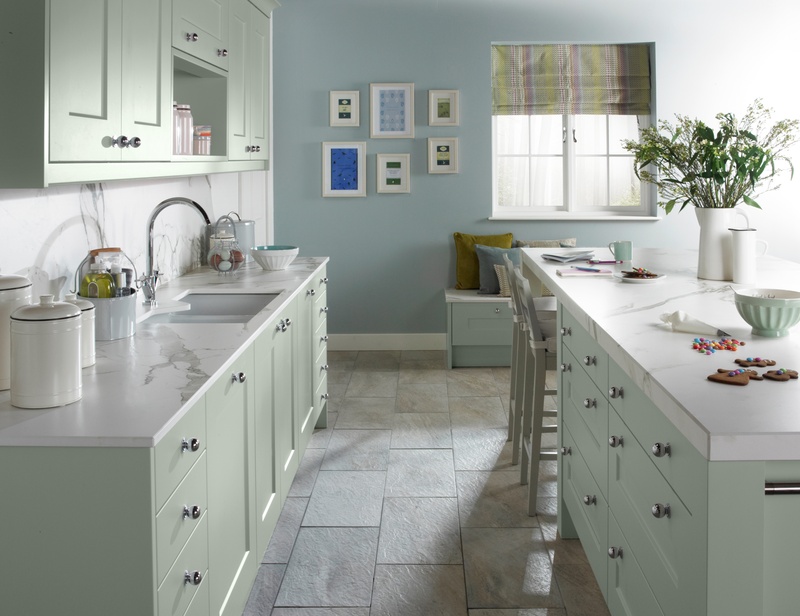 We’d love to chat to you about designing the kitchen of your dreams. All images used on this website with the exception of those in the Our Work section are stock or showroom photographs and for illustrative purposes only.